A VERSATILE ALL SEASON TIRE WITH OFF-ROAD CAPABILITIES. 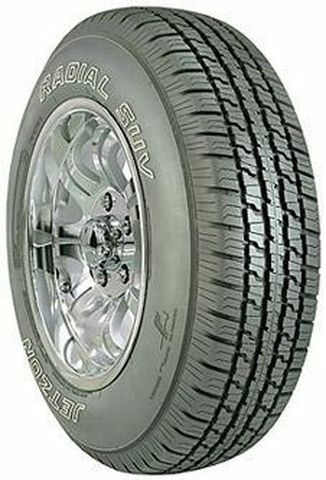 AN ALL PURPOSE TIRE AVAILABLE IN SIZING FOR SUV'S, PICK-UPS AND VANS. 265/75R -15 400AB 2,469 lbs 44 psi 11/32nds 8" 11" N/A 30"
Purchase includes the Jetzon Radial SUV tire only. The wheel rim shown in the picture is not included. Picture provided is a stock picture from the manufacturer and may or may not reflect the actual product being ordered. All Jetzon Radial SUV tires are continuously developing with manufactured improvements. With that said, Simple Tire and the manufacturers have the right to change these tire specifications at any time without notice or obligation. Please Note: Specifications of the Jetzon Radial SUV tires shown above are listed to be as accurate as possible based on the information provided to us by Jetzon tires. These are good looking tires and I love the way they look on my truck. The ride is very smooth & they handle really well but are very noisy. I noticed this as soon as I pulled out of the tire shop when I had them mounted. I was hoping this would subside over time but it hasn't change as of yet and hasn't gotten louder that I've noticed either. I haven't had them long enough to judge the tread life. I would highly recommend these if you don't mind the noise but this will probably be the last set I buy. They were an excellent price but really more disappointed on how noisy they are.